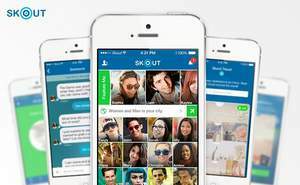 SAN FRANCISCO, CA--(Marketwired - Dec 6, 2013) - Skout, the world's largest global, mobile network for meeting new people, has released Skout 4.0 in the iTunes App Store. The new release encompasses a complete creative redesign, enhanced navigation and new features, enabling faster operating speed, user search and chat search. "In-application chatting is our heaviest trafficked function, and we are thrilled to bring our users an enhanced way to connect and find each other. We've seen our community evolve into a communication-centric one, and this update caters directly to that evolution," said Christian Wiklund, CEO at Skout. Skout 4.0 rolled out on Dec. 3 to iOS users. The update allows for chat caching and automatically populates the users most frequented connections to provide a seamless overall user experience and easily navigable interface. "Our users told us what they wanted, and we listened. We have revamped the entire application, streamlining navigation with an additional focus on our chatting feature, so that our community can connect faster and easier, enhancing the overall user experience," said Greg Burch, VP of Engineering at Skout. Skout has facilitated over 350 million connections in 2013 alone. Founded in 2007, Skout leads the market in mobile people discovery. Download Skout 4.0 here. Skout is the largest global, mobile network for meeting new people. At Skout, we are true believers in the magic of serendipitous meetings, and so we've made it our mission to enable just that. With your mobile device as your guide, you can discover new friends at the local neighborhood bar, at a concert at Madison Square Garden or on a bus tour in Barcelona. The Skout community spans more than 100 countries and is available in 13 different languages. Skout is dedicated to providing a platform that people can easily and safely connect on and change their lives. The company is headquartered in San Francisco. Visit skout.com to learn more and connect with us on Twitter @skoutapp.